One of the tools that you have at your disposal when it comes to getting your dog to stop chewing stuff in your home is anti-chew dog spray. The fact of the matter is; some dogs simply chew up everything in sight and unless you correct this behavior quickly, they are going to make it a habit and you will have a very difficult time keeping them from doing it in the future. Anti-chew dog spray can definitely help with that problem. But how do you know which anti-chew spray to get? How do you even know what to look for in an anti-chew spray? Those are all questions that we are going to answer in this buying guide. Let’s take a look first at five of the top anti-chew sprays that are currently on the market. There are quite a few anti-chew sprays to choose from out there, but we have been able to narrow down the wide market to just five that are really going to do the job. We will review each of these sprays one by one to see which meet your needs the best. The first anti-chew spray is this Grannick’s bitter apple, and it is the perfect bite deterrent for dogs. When it comes to getting your dog to stop chewing on your shoes, furniture or even nipping at your own ankles, you need something that is going to immediately tell them that whatever they are biting tastes bad and that they should stop. Your dog is not going to continue chewing if they hate the flavor of whatever it is they are biting, and this bitter apple spray is the perfect solution for that. It creates an unfavorable taste in your dog’s mouth that will immediately send the message that whatever they are biting isn’t palatable. But there are other things to love about this spray than just the flavor. For one thing, you can choose from the 8-ounce bottle, the 16-ounce bottle or you can get a two-pack of 8-ounce bottles. That gives you plenty of spray to apply to any part of the house that your dog normally chews. Depending upon how many dogs you have and how long it takes them to learn, you may go through anywhere from part of an 8-ounce bottle to a full 16-ounce bottle, but you probably will not need more than that because the taste is so strong that they will stop biting immediately. All you do is open up the packaging and spray the liquid with the nozzle pointing forward just once over an area that your dog normally chews; if you do this once a day for several days, then your dog is going to get the idea that that particular area is off limits. You will have to continue to do this until your dog does not chew anything that he or she is not supposed to. However, it is a good idea to make sure that you have some sort of replacement so that your dog can chew and cut his teeth on. Giving your dog a bone or a chew toy alternative is the best way to use these sprays effectively. 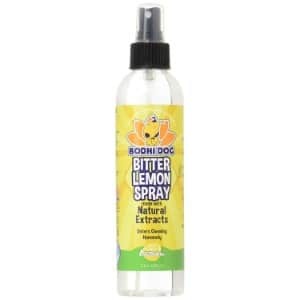 Bitter lemon can also be useful like the flavor of this Bodhi spray. This is one of the most effective and humane ways to get your dog to stop chewing on stuff. Corrective behavior such as tapping them on the head with an rolled up newspaper or saying “bad dog” in a loud voice – or using another noise correction tool – can be ineffective. Some people recommend that you spray them with water, but this isn’t just ineffective; it can actually erode your kinship with your puppy. The benefit of anti-bark dog spray is that you’re able to spray area in advance and they will not connect the bad taste in their mouth with your actions at all. They will simply stop chewing on that particular spot. This comes in both an 8-ounce and a 17-ounce bottle, so you will have plenty of spray to cover all of the areas of your house where your dog normally chews. This spray is one hundred percent non-toxic and perfectly safe. 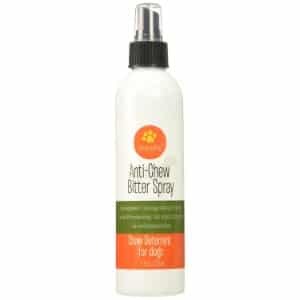 It is all natural anti-chew pet spray that won’t hurt your pet or do any damage to items that it is sprayed upon. This includes plants, your furniture, clothing and even human skin. This is a blend of natural bitter flavors with lemon and it makes an awful taste that your dog will hate and will cause them to stop chewing on whatever area this is sprayed on immediately. Just spray once a day or so and you’ll be able to teach your dog not to chew in about a week. This formula does not contain any harsh chemicals or additives. It is simply a plant-based botanical with natural bitters and lemon extracts. This means that it will not trigger your pet’s allergies or your allergies, and it will not damage anything that you spray it on. You can use it indoors or outdoors on all kinds of furniture, rugs, wood, blinds and more. Plus, the manufacturer is committed to providing quality products that do not damage the environment, so this spray is made in the USA, has eco-friendly recyclable packaging and even offers a 100 percent money back guarantee if it is not effective. Rocco & Roxie make this extreme bitter spray for dogs that are not responding to normal chew sprays. There are some situations in which dogs do not respond to standard chew sprays, and you have to up the strength of your solution if you want it to be effective. That’s exactly what this anti-chew dog spray provides. This is the extreme form of the standard liquid which means that it is twice as strong as the other anti-chew sprays that we have discussed. This is perfect for pets who have an extreme compulsion to chew or lick; such as pets that are recovering from injuries and have bandages on their wounds that need to be left alone. This spray is perfectly suited for puppies; which is not something that you can say about every spray on the market. It is also alcohol free. It lasts longer than some of the other formulas out there because it does not evaporate as quickly after spraying. When it comes to teaching your dog not to bite, you want something that is as powerful as you can get while still being completely safe for not only your dog but all of the surfaces that you spray it on. The more negative reinforcement of that you can give your dogs about biting particular objects or surfaces, the easier it will be to deter them from this behavior. This liquid is so bitter that will taste it once and they will turn away from it. In addition, this is perfect for dogs that are suffering from wounds and have a tendency to bite or nip at those wounds, because it contains soothing tea tree oil so that you can spray it on tender skin that is hurting. This gives you a two-pronged approach to keeping your dog from biting, licking or nipping at their skin. It provides relief from the discomfort that they are feeling as well as a deterrent to keep them from making the wound worse or tearing off their bandages. It is also saves on furniture and all of the other items in your house. If you want to use your spray for both dogs and puppies safely, then you might want to try this product out. This is the most powerful bitter deterrent currently on the market, and it was developed with the exclusive purpose of training puppies and dogs that need more handling and reinforcement than other dogs. You can apply this easily with no mess because it comes in an easy to use spray bottle which sprays the area that you want to protect with a light layer of the bitter liquid that your pet will taste immediately. This dog spray even comes with a 14-day training program that will show you how to use the spray most effectively to get your pet to stop biting and chewing all of the various objects in your house that you want to protect. This is an extremely useful feature, because it doesn’t just teach you how to use the spray, it teaches you other techniques as well that will communicate to your dog what you want so that the message has the best chance of getting through. This program is simple and easy to follow, and most of all, it is guaranteed to work within 14 days. This alcohol-free formula has been scientifically engineered to be perfectly safe for your dog as well as all of the items in your house that you want to keep your dog from chewing on. You can spray it on furniture, flooring, shoes, clothing, plants and anything else that your dog tends to chew on. This product even offers a 100 percent satisfaction guarantee. If the training program doesn’t work or if the spray is ineffective, then you can return it for a refund. That speaks to just how well this product works that the manufacturer is willing to stand behind it with such a guarantee. Finally, there is this option from OmegaPet. 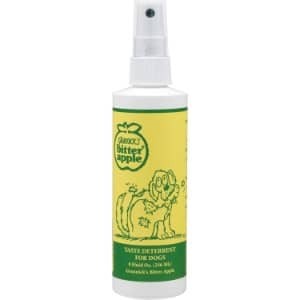 This bitter apple spray is for dogs and cats, and it is a potent chew deterrent that will help with lots of different surfaces. These sprays often come in a different form of applicant for cats because the hissing sound that an aerosol spray makes can be problematic for some cats. However, the sound of this aerosol can makes is pretty quiet, plus the taste is formulated for both of these types of pets. It is bitter apple that prevents chewing and biting on your furniture and anything in your house that your pets tend to tear up. This is another soothing formula that you can use on pets that are injured to prevent them from biting or chewing at their bandages or aggravating their wounds. This anti-chew spray includes soothing tea tree oil which is not only helpful in the healing of wounds and especially keeping them clean, it is also a soothing solution that makes pet wounds not itch as badly and helps with pain. It is also extremely concentrated and long-lasting, so you will be able to use just a single bottle to prevent your pets from chewing up things you don’t want them to. If you’re looking for a great price along with a bottle of anti-chew dog spray that is versatile enough to work on both adult dogs and puppies – plus is able to prevent cats from chewing up stuff – then this is definitely one of the best pet sprays for you. With the bitter apples taste that will let your pet know in no uncertain terms not to chew on that object and no odor, this is definitely the perfect spray for anyone looking for a great deal. When it comes to buying anti-chew dog spray, there are lots of things to keep in mind. You probably have lots of accessories for your dog anyway, and ways that you can for example, setting up a dog gate to keep them from dangerous areas or installing a dog camera so that you can see them when you’re not there prevents them from tearing up your house in some ways. But anti-chew dog spray allows you to passively protect an area that you know your dog chews on so that they experience a bitterness of taste when they next attempt to chew on it. Many pet owners find that they have dogs that just simply chew on everything and have to go with indestructible dog beds, a reinforced or metal dog bowl, or an outdoor dog kennel or electronic pet door to give their dog some exercise; or various other accessories to prevent their dogs from acting out. This is another one of those tools that you need. Anti-chew pet spray allows you to prevent your dog from chewing in the first place which means that you do not have to worry about correcting their behavior since they will not be exhibiting it. There are a few reasons why you might need spray to prevent dog from chewing. Your dog has certain behaviors that they exhibit as part of their personality and habits that they have formed. You need a dog house and dog bed because your dog has learned to use a den for sleeping in the dog house can model that. Setting up an automatic dog feeder can make sure they have food when they are hungry. In addition, accessories like dog bike trailers, a dog car seat cover and dog seatbelt or a useful dog stroller are all ways that you can get your dog to go for habitual walks with you even if they are not able to do so physically. But just like these other habitual actions that your dog wants to perform; chewing is something that they are meant to do. You can’t get mad at them for chewing, but you can teach them what they are allowed to chew and what they are not allowed to chew. That is the best way to teach your dog how to behave. Don’t try to change the habits that have been part of their genetic makeup for millennia, instead simply try to replace chewing the wrong items with the right ones. That why one thing that you might want to consider as an alternative to anti-chew dog spray is a chew toy of some kind; if you notice your dog chewing on their dog playpen or dog food container, or any of the other items in your house that you don’t think they should be chewing on, consider the fact that they may not have something that they can chew on. Your dog is going to chew on stuff no matter what, and the only way that you can prevent them from chewing on things that you own that you do not want them to destroy is by providing them with an alternative. If you do this, then you may not have any need for dog anti-chew spray at all. So, once you have determined that chewing deterrents for dogs are the right choice, then you need to decide what kind of anti-chew spray for dogs you want. One thing that you may want to consider is that there are two basic types of anti-chew sprays. The first one is preemptive, meaning that you spray the area where you know your dog is going to chew with a bitter liquid before they begin chewing. This prevents them from chewing when they encounter that particular taste. But you can also keep them from chewing with an anti-chew spray that uses noise to distract your dog from chewing on that spot in the first place. Think of these types of anti-chewing sprays as sort of like air horns to keep your dog from going to town on that particular spot. Noise based spray should never be used with young puppies who are already sensitive to noise and whose ear muscles may not have formed completely. In addition, using this type of device around a nervous dog that already has anxiety problems can exacerbate those problems and make it even more difficult for them to get over their issues. Obviously, for many dogs, the type of anti-chew dog spray that sprays a bitter liquid is a better choice. However, you have to know your dog. You want to make sure that they are going to be more affected by the taste than they are by noise for one thing, and you also want to make sure that whatever liquid you are getting is going to be safe for your dogs. Some dogs have particular allergies, and while most of the anti-chew sprays on the market is safe for almost any dog even ones with allergies, you still want to be cautious of this. You also want to make sure that whatever you choose is going to be effective. Besides choosing the right product, you are also going to want to know how to use the anti-chew spray most effectively. There are several techniques that you can use in order to ensure that you use this spray as effectively as possible. They are only going to be effective if you use them as part of a larger program that teaches your dog not to bite or chew the items around the house that they are not supposed to. In other words, you have to teach your dog what is appropriate chew on and what is not. Your dog is not going to recognize that because you sprayed one piece of furniture with anti-chew spray, that all pieces of furniture off-limits. However, if you can combine this anti-chew spray with verbal commands and regular training, then you will be able to teach your dog what is appropriate to chew on and what is not. You definitely should avoid spraying everything in your house with the anti-chew dog spray because your dog will get confused without understanding your message. You need to spray only items that are prohibited that you know that your dog normally chews on. If you preemptively spray everything in your house, then your dog is not going to know what you want and will have a very hard time correcting their behavior. Plus, they will stop chewing on everything, including their own chew toys, which will make them really sad. You also do not want to spray your dog directly with the anti-chew spray no matter the flavor, nor do you want to use the noise dog anti-chew sprays near your dog’s ears because you could damage their hearing. Remember, your dog is not acting out or exhibiting bad behavior, they are simply being a dog, and you just need to steer them in the right direction so that they know what they can chew on and what they cannot. Some people are curious about whether or not they can make their own sprays instead of buying them. While it is possible to make your own sprays, there are certain things that you want to keep in mind. The sprays that are on the market are usually intended for dogs of any shape and size and even allow for particularly health problems. For example, dogs that have an allergy will still be able to benefit from these anti-spray devices because they will not be allergic to the ingredients that are used to make them. If you make the same things yourself, you may save a few bucks, but you may inadvertently include ingredients that will trigger your dog’s allergies. There are various ingredients that people use to make their own anti-chew dog sprays. For example, many people use citrus in order to create a bitter taste of dogs will not like. Citrus is a very good bitter taste in concentrate, and it is true that not many dogs will react badly to this particular bitter taste. However, there are other alternatives as well. For example, you can make bitter taste out of particular citrus fruits that are used in standard dog anti-chew sprays like lemon. You can also use things like cayenne peppers, vinegar and other bitter or unattractive sensor tastes to keep your dog from chewing. You can make your own anti-chew dog sprays if you are careful, but you should be aware that there are plenty of things to be aware of and make certain that you have done your research to determine your anti-chew dog spray is perfectly safe for your dog. The bottom line is that there are plenty of things that you have to keep in mind when you’re buying anti-chew dog spray. Although you can make it yourself, it is possible to add ingredients that will trigger dog’s allergies or contain things that are not healthy for them. The best idea is to purchase your anti-chew dog spray online where you can have lots of different choices from anti-chew sprays that you know have already been vetted and tested and are perfectly safe for your dogs and other services. Anti-chew sprays can be an amazing training tool if you use them properly, and there are lots of different flavors out there to choose from so you will be able to find a taste for your dog finds unpalatable. This buying guide should give you some choices and information that will help.